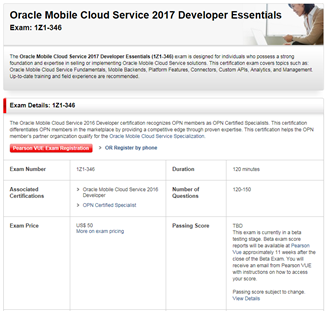 PartnerNetwork is pleased to announce that the Oracle Mobile Cloud Service 2017 Developer Essentials Exam (1Z1-346) is available in beta testing! This certification covers topics such as: Fundamentals, Mobile Backends, Platform Features, Connectors, Custom APIs, Analytics, and Management. Up-to-date training and field experience are recommended. This certification is available to all candidates, but is geared toward members of the Oracle PartnerNetwork. OPN members earning this certification will be recognized as OPN Certified Specialists. This certification qualifies as competency criteria for the Oracle Mobile Cloud Service specialization. Take the exam for free while in beta testing! Request a beta voucher via the OPN Beta Certified Specialist Exam Voucher Request Form! We advise partners that are planning to become specialized in this area to have their mobile developers take this new exam. You can access the Oracle Mobile Cloud Service 2017 Certified Developer Exam Study Guide to get pointers to training and resources that can help you prepare for the exam.